I made this quiche for The Blog Tech and his wife this weekend. They loved it! 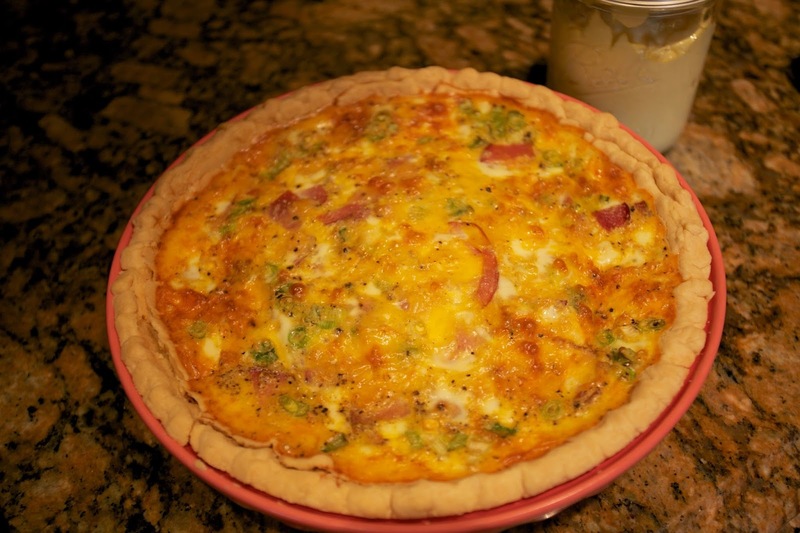 It's just like eggs Benedict in a quiche form. Though the recipe didn't call for cheese, I added some gouda to it. 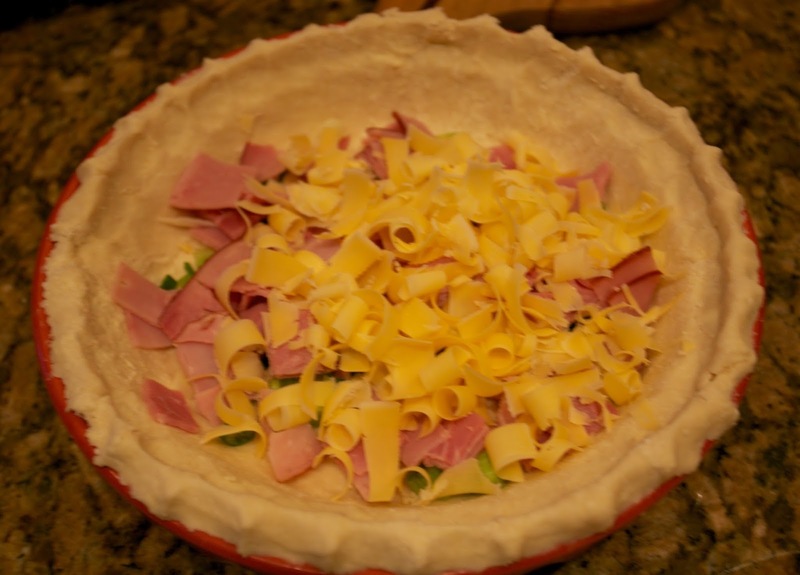 Preheat oven to 350° F. Add unbaked pie crust to a deep dish pie pan. 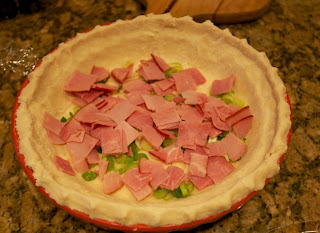 Finely chop green onion and cut Canadian bacon or ham into small squares. Spread onions and Canadian bacon pieces evenly over the bottom of the pie crust. 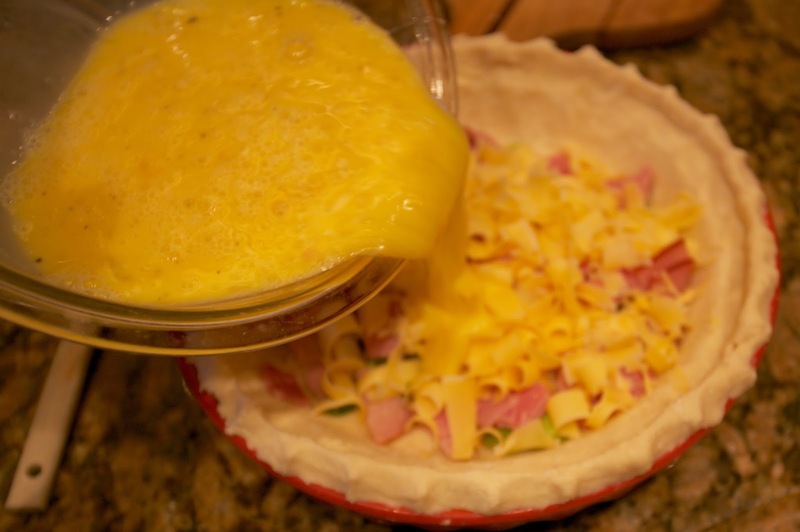 In a large bowl, whisk together eggs, milk, salt, pepper, and mustard powder. 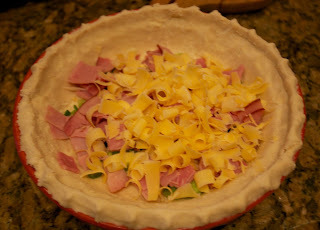 Pour over the onions and Canadian bacon in the pie dish. 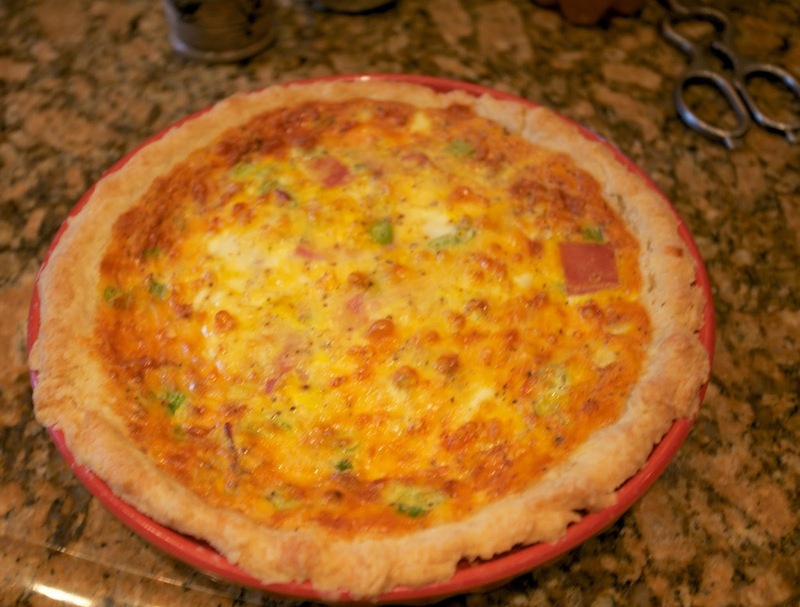 Bake for 1 hour or until the eggs are completely set. They should not jiggle in the middle. Remove from oven and cool for 5 minutes before cutting into 8 slices. Add egg yolks, lemon juice, dijon, and cayenne to a blender. Close lid and blend until smooth. Heat butter in a microwave-safe dish until melted, about 1 minute. 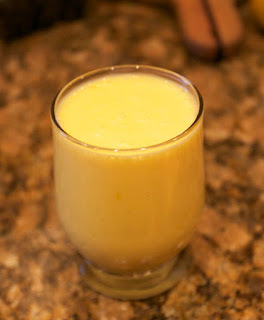 While butter is hot, pour into egg yolk mixture in a thin stream while blending. Sauce should thicken quickly. 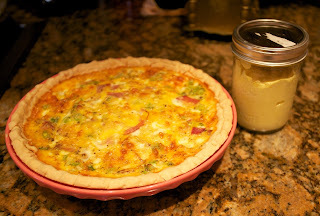 Serve over warm quiche. Top with finely chopped parsley. This is a very easy hollandaise to make. If you need to reheat it, place it in hot water in a jar. Don't reheat it in a microwave or it will turn into scrambled eggs. Apparently this was so good that the next day when they had to go to a potluck brunch, they asked for another one. I wouldn't know, I didn't get any. But I made them another. It smelled very good though. Love your blog- long time fan that doesn't comment much- my Mother has lung cancer/bedridden/incontinent/etc. Anyway,I think I have found the secret to peeling eggs without nicking them! I doesn't require any salt or vinegar in the water either! When you peel the egg, have water running over it that is WARMER than the egg itself. Cooler water makes the membrane that is attached to the shell stick to the egg, and warmer water makes it release. I have tried this on about 100 eggs to make sure it works as boiled eggs are one of the foods my Mother will eat. Hope this helps you out! If only there was no ham. I am making this at some point in the not so distant future. YUM. Another one that is doable for me. Things are going pretty much as you would imagine. One day at a time. Sending love! Oh yum! That looks awesome! I bet it was superb! !